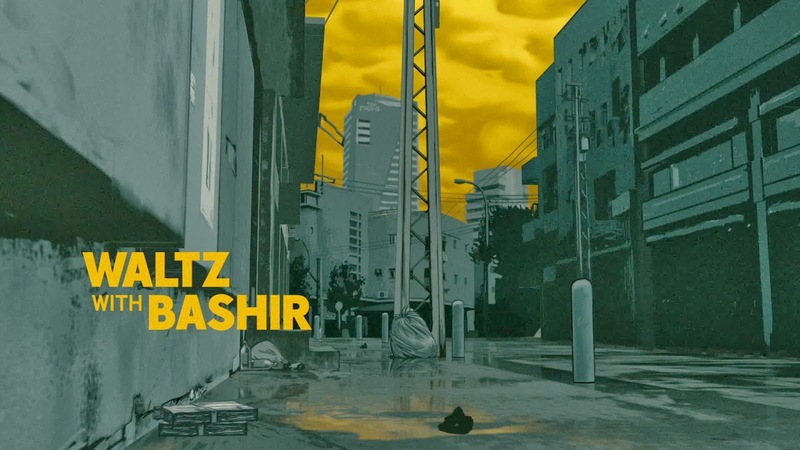 The opening credits of Waltz with Bashir accompany a pack of slavering murderous mongrels galloping across a city to the beat of throbbing rock music. We're in media res. We're in a dream sequence. We're in a flashback. It's jarring and random, but it quickly coheres. A friend of director Ari Folman is sitting with him at a bar, recounting a nightmare. As a young soldier in the 1982 Lebanon War he was ordered to shoot 26 dogs so that their barks couldn't alert PLO agents to Israeli raids, and twenty years later his loathing of the canine slaughter remains undiminished. Folman is sympathetic, but when asked what he remembers of the war, he can't recall a thing; it's all blocked out. He goes home disconcerted, and that night a single fragment surfaces: he is bathing on the Beirut coast by the light of military flares on the evening of the nearby Sabra and Shatila civilian massacre. Determined to reconstruct his missing memories and bring the truth to light, Folman talks to his psychiatrist and tracks down a friend in Holland, fellow war buddies and a news reporter who covered the events. 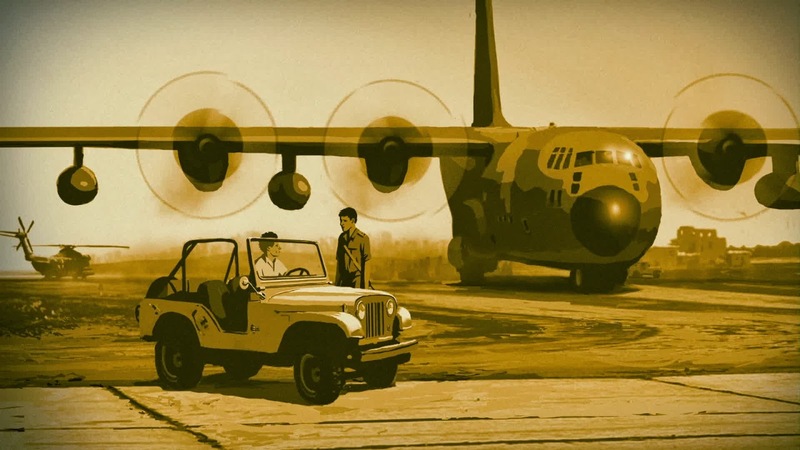 Along the way we see their stories and Ari Folman's depicted in animated flashbacks that capture the exhilaration, devastation, terror, strangeness, confusion and numbness of war. 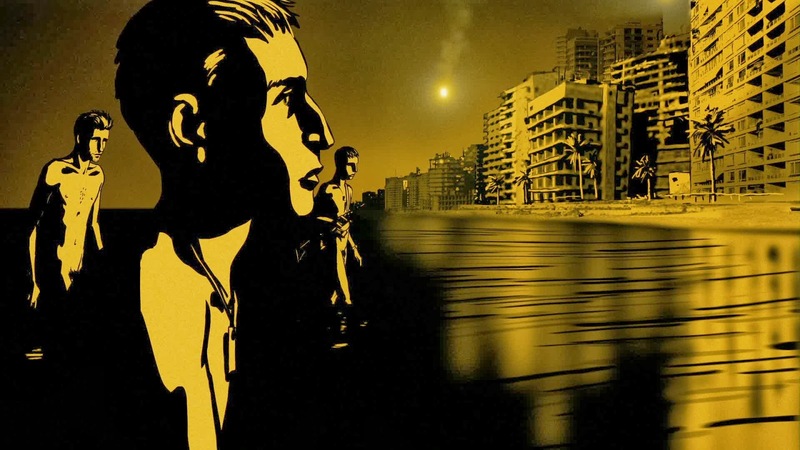 The first thing that strikes one about Waltz with Bashir is the animation, the first of many stylistic risks that Ari Folman takes in his highly personal autobiographical documentary. 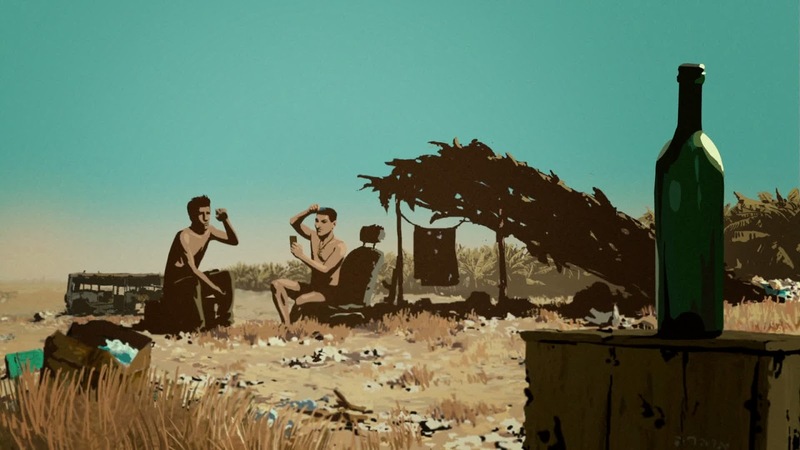 Animation, still often unfairly associated with family films and comedic cartoons, isn't exactly the obvious choice for a non-fiction work covering not just harrowing eye-witness accounts of the Lebanon War, but a genocide of Shiites that took place almost literally under the narrator's nose. The film's various flashbacks offer a multifaceted emotionally-exhausting look at the incongruity of civilian life with combat experience; of young men who, days before, were primarily concerned with keeping up their grades and getting laid, who are now asked to load tanks up with corpses or stalk through orchards gunning down children armed with RPGs. As these events are told to us the camera frequently cuts back to the present, where Folman sits with a friend or colleague and discusses their memories of the past. These conversations are often brutally and even uncomfortably honest, confessions from out of the shadowy, ignoble chaos of war. Folman discovers that he is not alone in feeling the corrosive undercurrent of repressed guilt and a desire both to flee from and face the acts of inhumanity that surrounded the massacre, but ultimately he is left to judge his level of involvement and culpability alone (although in creating this documentary, beyond the merely therapeutic value he early-on suggests, there is also a sense that he is inviting us to judge him too). Lingering in the psychological background is the legacy of the Holocaust, which Folman's parent's survived, and the chilling dread of finding yourself on the other end of a war crime. 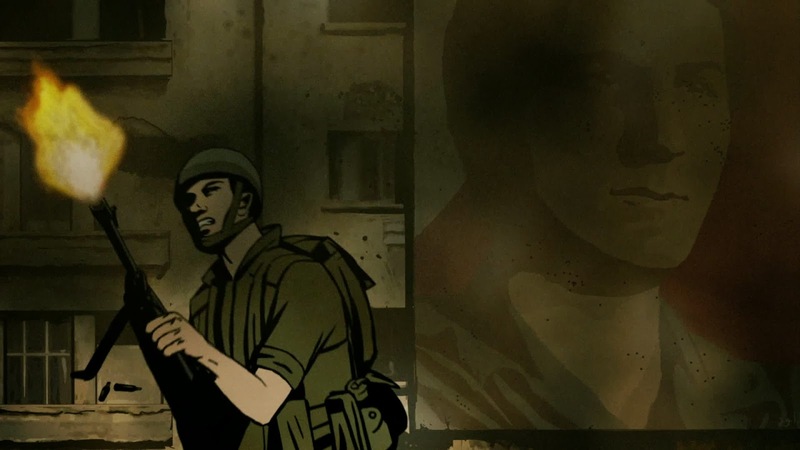 For all its thematic heaviness, Waltz with Bashir's storytelling is brisk and invigorating. 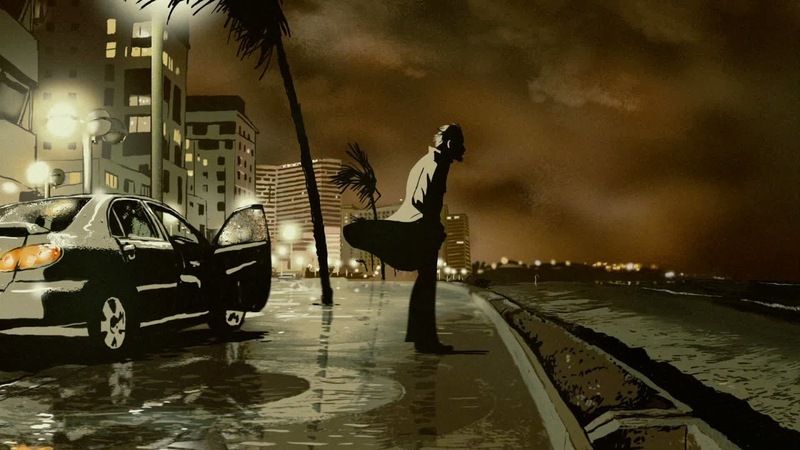 The animation style, which looks like a dramatically more palatable update to the poorly-received rotoscoping of yesteryear, uses clean bold lines and high-contrast colors, frequently in monochromes typified by the black and gold of Folman's flare-lit Beirut nightscapes. Many of the vignettes have a heart-pounding music-video sensibility, boldly mixing period 80s synth-pop and post-punk like OMD's "Enola Gay" and PiL's "This Is Not a Love Song" with arrangements of classical music. 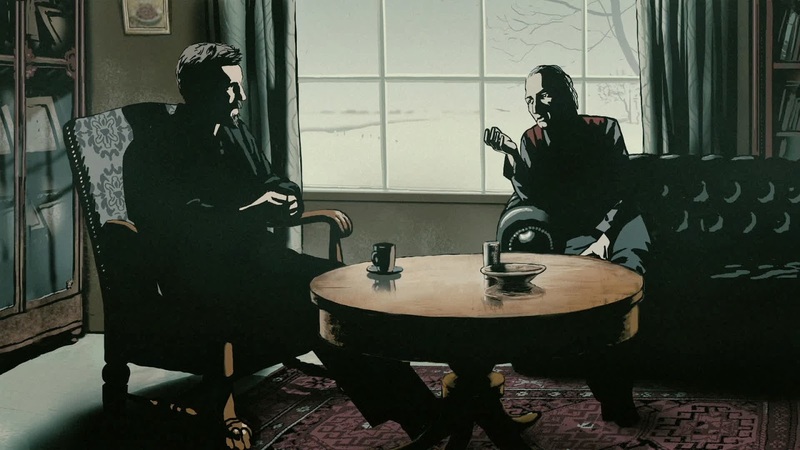 Folman doesn't waste the unique freedom of the animation medium, and while respecting the sensitive and serious nature of his material, explores the slippery flexibility of memory, the moody heightened-reality of dreams and the surreal beauty of war (notably in the titular 'waltz with Bashir' in which a soldier seems to dance amid hissing streaks of enemy gunfire and posters of the recently-assassinated politician). I was supposed to see this but didn't, and now I forget why. It played at the SLIFF, right? Anyway, I almost feel like you namedropped two amazing songs specifically to check if I'd notice, and I'd like to hereby report that I did. It played at SLIFF at the same time as another excellent animated film: From Inside. We figured Waltz was much more likely to come out on DVD promptly (and boy were we right). I loved From Inside, though, and I'm glad we scored copies of dvd from the composer. It has since received an official release and I've meant to buy it. That's right! Now I remember. I just googled "From Inside" and the first text was "From Inside Returns With A Gary Numan Special Edition Film Score". Woah! I missed a few of your posts while I was SXSWing, so I did my best to catch back up over the past week.